An opportunity to witness traditional Native American culture will occur this summer during a two-day event on Friday and Saturday, July 24–25. 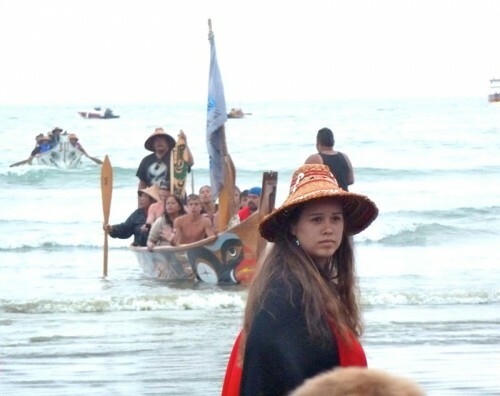 The G’ana’k’w Canoe Family, the Lummi Nation and the Semiahmoo Nation, paddling three handmade canoes, will arrive at Telescope Beach at Marine Park on Friday, July 24 during their annual multi-nation canoe journey. Other tribe members wearing traditional regalia will welcome them to the land with singing, drumming and a traditional canoe arrival ceremony. Blaine residents Ron Snyder and Cathy Taggett, who own Circle of Trees Studio and Homestead and are members of the G’ana’k’w Canoe Family, are helping coordinate the arrival ceremony and a potlatch, which will be held on Saturday, July 25. This will be the first time in more than 100 years that native canoes have made Blaine their destination and not just a short stop on a journey to another location. The multi-family canoe journeys began in the Northwest in 1986 and have occurred annually since 1993, Snyder said. The G’ana’k’w Canoe Family’s goal has been to involve more tribal communities in the Northwest in showing pride in their heritage and preserving their customs, Snyder said. The annual canoe journeys provide the opportunity to teach culture to their youth as well as community members, he said. Blaine was chosen as the destination this year because of its proximity to where most the families are located and because Snyder and Taggett are locals. Community members are welcome to witness the ceremony, which will start when the canoes arrive around 1 p.m. on Friday in order to take advantage of the high tide. The arrival is the culmination of a 60-mile, four-day journey from Cama Beach on Camano Island starting on July 21. Other stops along the way include the Swinomish Nation near La Conner, the Lummi Nation and Sucia Marine State Park. The ceremony will be very traditional, Snyder said. Tribe members will arrive singing songs in their native languages and continue to follow traditional protocol. As the canoes arrive, a speaker in each canoe will ask permission from the elders of the tribes to come on land. Once granted permission and thanking the Blaine community for welcoming them, the members will turn the canoes around and arrive backwards. Arriving backwards is a safety tactic started long ago since it is easier to paddle forward than backwards, Snyder said. The canoes will then be lifted onto the land because it is considered disrespectful to drag them, he said. A potlatch will be held at around 6 p.m. on Saturday. Members of the public are welcome to attend. The potlatch will have speakers, singing, dancing and gift giving. Many community members will receive a gift, since a potlatch is traditionally an event where wealth is given away and shared in order to build a stronger community. The journey is supported by grants and volunteer work from community members and businesses. To prepare, the members have been practicing paddling and maneuvering the canoes and everyone involved has received cold water capsize training. Snyder and Taggett have been giving presentations about the canoe journey at libraries, schools and city meetings, and many members have been busy making gifts, food to freeze and traditional regalia and preparing songs and stories for the potlatch, Snyder said. To volunteer, contribute or ask questions contact Ron Snyder or Cathy Taggett by phone at 360/305-8231 or 360/332-8082 and by email at circleoftrees@wildblue.net.